You just picked a fight with the wrong person. What is the best case of “you just picked a fight with the wrong person” that you’ve witnessed? I was about 22, on summer break from college and I’m in a neighborhood bar with my friend Greg (…his name). We’re at the bar and we meet a guy named Bull (…apparently not his name…but he looked like a bull). We meet the guy, he seemed like a nice person so the three of us are hanging out drinking beer. Bull is dressed way too nicely for this bar and another patron…drunk…stumbles into him, apparently by accident, spilling beer on bull’s clothes. Bull is nice about it, the patron…is not. Greg and my eyes light up. The patron reaches under his jacket and attempts to pull a .45 automatic from his belt. I say attempt because before he can put his hand under his jacket, bull drops him with a left hook to the temple. The “crack” of the punch is heard throughout the bar, and if you blinked you would have missed it. Greg and I didn’t miss it. Now…this is a place where what has gone on so far is not uncommon and if security has to step in it’s at the end of a sawed off, pump action shotgun. This patron is out like a light so security isn’t involved…yet. Bull reaches down, takes the .45 out of the guys belt, unloads the chamber, takes the clip out, puts the unloaded gun on the bar and we continue to drink, The bartender (…lady bartender) comes around with a pitcher of ice water and pours it on this guy to wake him. NOW…security gets involved. This patron turns around face first into the barrel of the shotgun. “I’ll have that gun please”…he says please. Greg and I come to find out Bull just got released from jail for assault and battery and has a fairly extensive amount of experience dealing with people who are armed…as is evidenced by the incident. This was his first night out and he didn’t want any trouble…but sometimes trouble finds a man before a man can find trouble. “What do you want to do?”, I ask bull. A half hour goes by and the guy shows up; ..in his gremlin. He has another gun, he’s got it hanging out the window. He’s honking his horn for bull to come out. Greg and I go inside and tell bull. We ask does he need us to go out with him. Bull says no, but he gives Greg a phone number on a slip of paper, asks Greg to call the number and give this address to whoever answers telling them he’s got a problem. Greg goes to the phone. Bull leaves. …I’m dying from laughter, everyone in the bar is dying from laughter, this guy is out cold…again…this time in the parking lot. Bull collects the gun…again, unloads the chamber, takes out the clip and throws the gun on the other side of the parking lot. Someone asks the bartender if she’s going to go out and wake him up again, she says, “NO! Leave him!”…more laughter. She walks away shaking her head and by this time the bar is rolling. This guy wakes up…again. He hasn’t had enough. He’s screaming, cursing and crying. He holds his jaw and goes back to his gremlin. He going to go get his friends, he’ll be right back. Bull says he thought so, he’s called his friends and Bull says he might just want to go home. This guy doesn’t know when to quit. He in his car and on his way. Two minutes later. A white cadillac followed by three black sedans pull up. If you’ve ever seen the original Superfly movie from the seventies…I am here to tell you Superfly showed up with his crew. 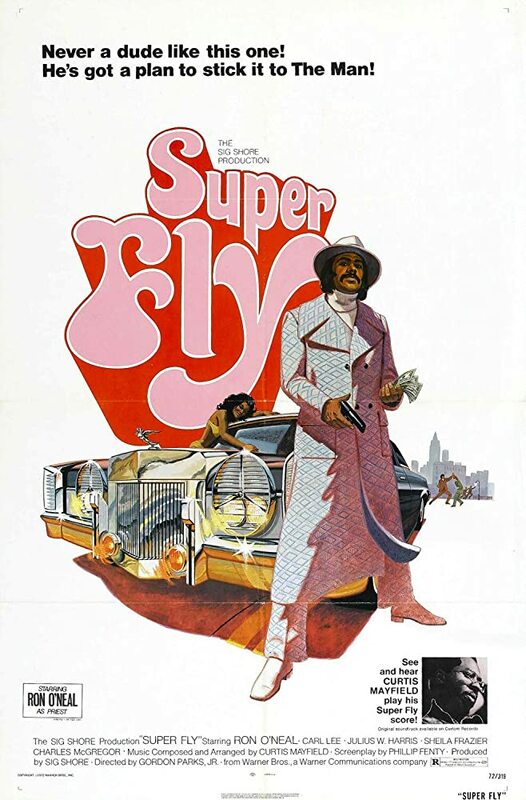 …THIS is the original Superfly…and this is who showed up. The exact car, the white suit (no hat or coat…it’s summertime), the hair, the girl dressed in a white gown…EVERYTHING…followed by three black sedans with tinted windows. Bull walks over, shakes hands and gives “Superfly” a hug, he brings “Superfly” over to greg and I and introduces us. “I’ll try not to have to call you on it”. Greg refuses the money as well. We go into the bar and Superfly buys us a drink, the sedans wait for this guy to come back. I leave shortly after the drink with the uncanny feeling this guy isn’t coming back.